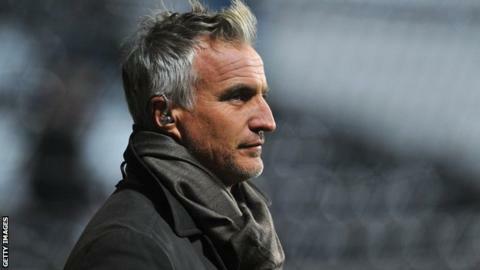 Former France international David Ginola is "still fighting" in his bid to stand for the Fifa presidency. A statement on the Team Ginola website seemingly suggested his campaign, backed by a bookmaker, to stand against Sepp Blatter was over as it promised to refund backers. But a spokesman said: "We're still in it and still fighting." Ginola later said via Twitter he was not giving up. The Swiss confirmed his submission to stand again for the presidency of football's world governing body before Thursday's midnight deadline. His challengers are set to include former Portugal and Real Madrid winger Luis Figo, Dutch FA president Michael van Praag, Asian Football Confederation vice-president Prince Ali bin Al Hussein and ex-Fifa executive Jerome Champagne. Candidates must have played an active role in football administration for two of the past five years and be publicly nominated by five of Fifa's 209 member associations. It was confirmed on Thursday that the Football Association has formally nominated Prince Ali Bin Al Hussein as a candidate to stand. FA chairman Greg Dyke said: "The board discussed the upcoming Fifa presidency election and the welcome proliferation of candidates in the race. "We agreed to formally nominate Prince Ali of the Jordanian FA, but also noted the encouraging reform message being offered by Michael van Praag. "We will now await Fifa's final confirmation of the candidates and look forward to assessing the manifestos of all who are entered into the election on 29 May. "We have said for a long time that a new approach is essential within Fifa. I welcome the chance for a considered debate in the weeks ahead before we decide where the FA casts its vote." Fifa's electoral committee has said all the nominees will have to pass an integrity test. The final list of candidates is expected to be announced next week.